Irish-American artist Sean Scully (born in 1945) is regarded as one of the most important painters of our times. Scully became famous for his consistently repeated method of composing images in vertical and horizontal stripes of colour. Scully’s visual cosmos is of genuine – even physical – intensity. Paintings of great sublimity result from the clash between constructive considerations and emotional energy. 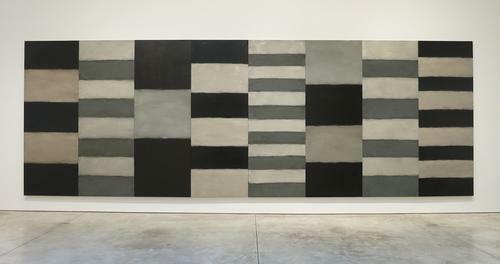 A citizen of the world, Sean Scully has studios in New York, Barcelona and Munich. In addition, he has gained an excellent reputation as teacher at the universities of Princeton and Harvard. He has had exhibitions in all the big houses, the Metropolitan Art Museum in New York among them. His works are to be found in more than 120 collections of the most important museums. The exhibition in Rostock shows newer as well as less-known works illustrating Scully’s development from figurative to abstract art. Although it is not didactically structured, the exhibition still provides an extremely interesting and surprising insight into the genesis and the genius of his work.